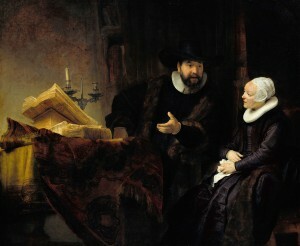 The Dutch Dissenters Blog examines the complex, fascinating, and largely unexplored period of “classical” Anabaptist and Mennonite history from the “Radical Reformation” until the “Radical Enlightenment.” In Dutch and northern German towns, a unique culture of Protestant dissent grew in significance starting in the 16th century, and adult baptists played a leading role in this milieu. Few English-speaking readers (including scholars) know much about Protestant dissent from the earliest years of the Golden Age until the post-Napoleonic years of the 19th century. In fact, much of what they think they know is based on questionable sources. This blog is dedicated to shedding light on the early history of Protestant dissent in general and Anabaptism in particular. The “classical” period of Anabaptist-Mennonite history can be divided into three sub-categories. These three categories are the focus on the blog. 1. 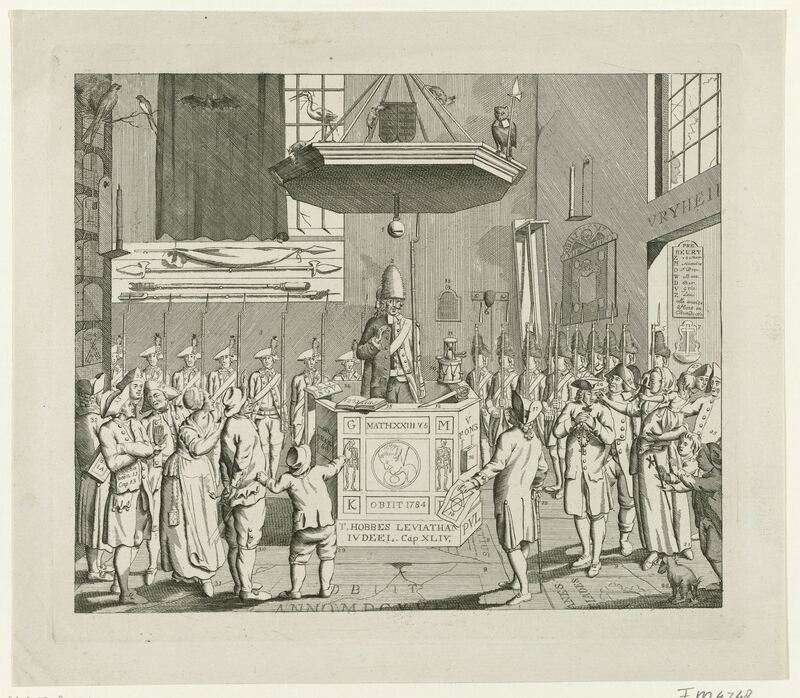 The history of EARLY DISSENTERS: A major theme of this blog will be the study of Anabaptism, spiritualism, anti-Trinitarianism, Socinianism, and other varieties of early Reformation dissent in the Dutch- and German-speaking territories. 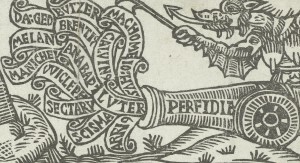 The image above is a woodcut by Erhard Schoen from about 1535. 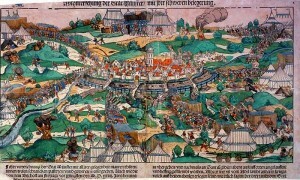 Its title is “Abconterfehung der Stat Münster/ mit irer schweren belegerung” (Illustration of the city of Münster and its massive siege). 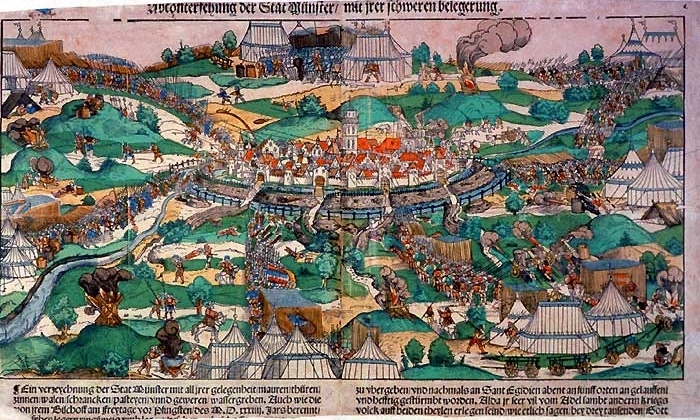 The events depicted are probably the unsuccessful attack against the fortified city in May 1534. Copies of the illustration are at the University of Michigan Museum of Art, the British Museum, the Herzogliches Museum Gotha, and the Landesmuseum Münster. For other images by Erhard Schoen, see http://www.zeno.org/. A long-term goal of the Dutch Dissenters Project is to create an exhibit on the history of the Anabaptist rule in Münster, one of the most controversial and (in)famous episodes in the history of the Reformation. 2. The history of GOLDEN AGE DISSENTERS: The Dutch Golden Age was also a golden age of confessional Mennonitism, that is, Mennonite culture organized around confessions of faith, catechisms, official histories, and other “confessional” texts. But it was also much more. It was the age of Collegiant revivalism and Remonstrant protests, as well as philosophical innovation embodied by Descartes and Spinoza, and the artistic innovations of Rembrandt, and other less well-known thinkers and artists. Mennonites, spiritualists, and other dissenters played an active role in the cultural and religious ferment of the 17th century. Another goal of this project is therefore to enrich knowledge about these activities. The long-term goal of this aspect of the project is to aim toward the creation of a separate webpage for a developing group research project entitled “Amsterdamnified! 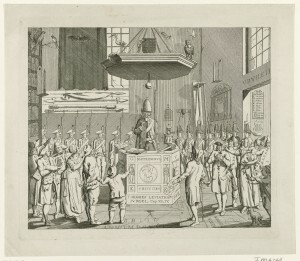 Religious Dissenters, Anti-Providential Ideas and Urban Associationalism in the Emergence of the Early Enlightenment in England and the Low Countries, 1540-1700.” Gary Waite at the University of New Brunswick at Fredericton is the project leader, and Mike Driedger is an assistant coordinator. 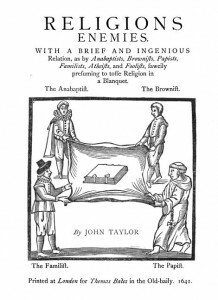 Source = The Works of John Taylor (Manchester, 1870); the pamphlet was originally published in 1641. 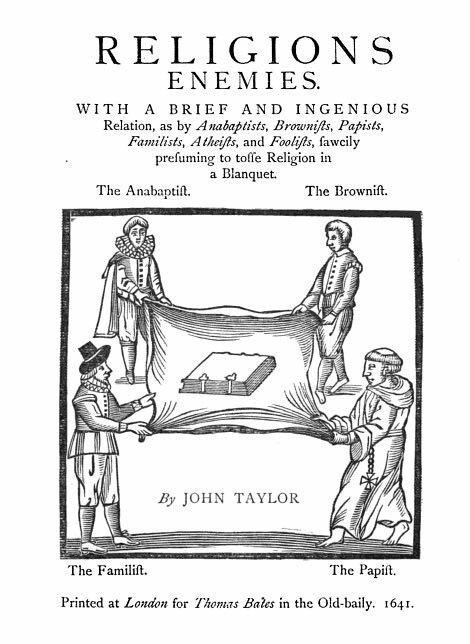 John Taylor is the first author known to have used the term “Amsterdamnified.” In his 1641 book Religions enemies he decried the breakdown of religious uniformity in England, which he argued was the result of an ill-advised toleration of the sort practiced in Amsterdam. 3. The history of ENLIGHTENMENT DISSENTERS: Although they did not dominate Dutch public life, Mennonites were among the leaders of Dutch culture from the earliest years of the Enlightenment. They were philosophers, professors, poets, playwrights, preachers, publishers, printers — to name just some of their roles in the Dutch public sphere. Their significance grew with time. From about the 1770s until the beginning of the 19th century, the Netherlandic territories were in political turmoil. A fundamental issue in these years was the question of how (or if) religious dissenters should be integrated into the political mainstream. In these years Mennonites were leaders in campaigns to establish a new constitutional order. A high point of this historical trend is a 1798 coup d’etat led in part by men from Mennonite families (Wybo Fijnje and Pieter Vreede). Although most scholars pay little attention to the leadership roles in philosophical and political life that a significant number of Dutch Mennonites took in the 18th century, these roles will be a major focus of this blog. A cartoon of F.A. van der Kemp as a Mennonite preacher and a militia leader, ca. 1786. Source = Rijksmuseum Amsterdam. A key reason for addressing these subjects online rather than in standard printed academic forums is to take advantage of the many new tools for data visualizations. Of course, at the most basic level this includes the easy publication of images. More and more museums and galleries are making their collections available for scholarly and even general use. These include the Rijksmuseum in Amsterdam and the Amsterdam Historical Museum. In addition to these fantastic image databases, there are also increasing numbers of free and easy-to-use online programs for interactive data visualization and text analysis. The size of the words indicates the frequency of words in the source document. Try hovering over concepts in the word cloud with your cursor, and click on terms that you’d like to learn more about. See what happens. 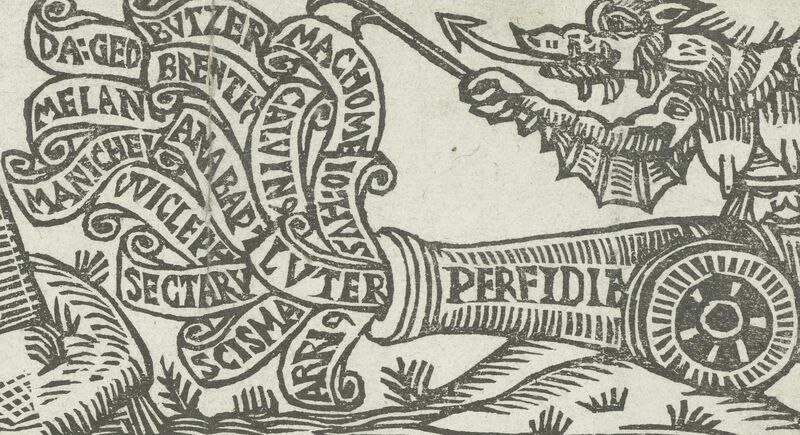 The source for the word cloud above is an anonymous article dated 29 July 1765 from the journal De Denker (no. 135). The title of the article is “Over het verbranden van Kettersche Boeken, en de bittere Geestelyken, die dit bewerken” (On the burning of heretical books, and the bitter clergymen who cause this). The content of the journal is available online at http://www.dbnl.org/titels/tijdschriften/tijdschrift.php?id=_den001denk00. The Mennonite preacher Cornelis van Engelen was the editor of the journal for much of its existence. I made the word cloud using the text analysis program Voyant Tools created by Stéfan Sinclair and Geoffrey Rockwell. I have compiled a special Dutch stop word list that includes contemporary and older spellings of common Dutch words. You can access the stop word list at my academia.edu page. One goal for this blog is to embed dynamic frames like the one above that will allow visitors to explore the texts themselves. If you would like to try using Voyant yourself, experiment with the interactive frame at http://voyant-tools.org/. To produce a word cloud, copy a text into the Voyant frame and press “reveal”. You’ll have to apply a stop word list to eliminate distracting words. As of January 2015, a Dutch stop word option is available through Voyant. See the blog posts for occasional examples of Voyant and other tools in action.